Here at Soapy Soap Co., we adhere to several quality standards for all products. These standards include: 100% vegan (plant-based), halal (Muslim-friendly), and cruelty-free (no animal testing). Today’s post is all about one standard that often sticks out to our customers: Gluten-Free. We've seen it many times at our market and festival booths- people see our sign mentioning that our soap is gluten-free, and they roll their eyes, saying "gluten-free soap?! Everyone is jumping on the gluten-free bandwagon" before walking away. Well, today we're setting the record straight once and for all! The topic of gluten-free soap quickly raises some questions: why should soap be gluten-free? Does soap typically contain gluten? Is this like advertising “gluten-free water” (which should never contain gluten in the first place)? Not to worry, we’ll answer all of these questions, and more! 1. Why should soap be gluten free? This question is best answered with a story: soon after Soapy Soap Co. was founded, we were selling our products at a farmer’s market. A customer approached the booth and asked if our soaps contain gluten. We said that we didn’t know, and asked why- it turned out that the customer had a condition where they could only use natural soaps that do not contain gluten, otherwise their skin would break out into rashes. We then learned that one such condition is an extreme wheat allergy, wherein skin contact with gluten may cause rashes(1). 2. Does soap contain gluten? If so, what ingredients are used in soap that may contain gluten? The two ingredients that we had to change were: oatmeal and cornmeal, two natural exfoliating/scrubbing substances that we use a lot in our bar soaps, such as Replenish-Lavender Tea Tree, Body Be Moist-Lavender, and Body Be Clean-Clove. Interestingly, neither of these ingredients contains gluten in and of itself, however, when we called the manufacturers, they said that those ingredients are processed in facilities that also process wheat, barley, and/or rye, all of which contain gluten. Replenish! 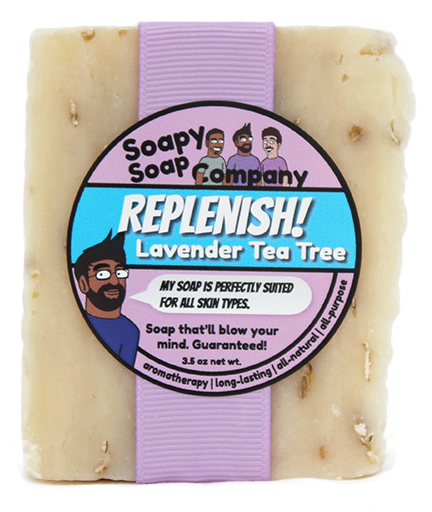 - Lavender Tea Tree bar soap- which contains oatmeal. To ensure that our oatmeal and cornmeal are safe to use for celiacs and other gluten-sensitive people, we switched to certified gluten-free oatmeal and cornmeal. Certified gluten-free ingredients are more expensive, but we think it’s worth it, in order to provide great soaps to people who are limited in what they can use. 3. Is this like “gluten-free water"? 1. Green, P.H. and Cellier, C., 2007. Celiac disease. New England Journal of Medicine, 357(17), pp.1731-1743. 2. Mariko Sugiura and Keiji Sugiura, 2012. Immediate Hypersensitivity to a Hydrolyzed Wheat Protein. Asian Journal of Dermatology, 4: 1-5. Posted on Oct 6 2016 by Anthony . Posted in Soapy Stories. Tagged behind the scenes.